Spring has practically sprung, which means it’s time for all of us—even date rapists—to bust out our coolest warm weather threads! But where exactly could the aspiring fashionista/sexual predator pick up some affordable basics that both flatter and warn everyone to avoid your company? 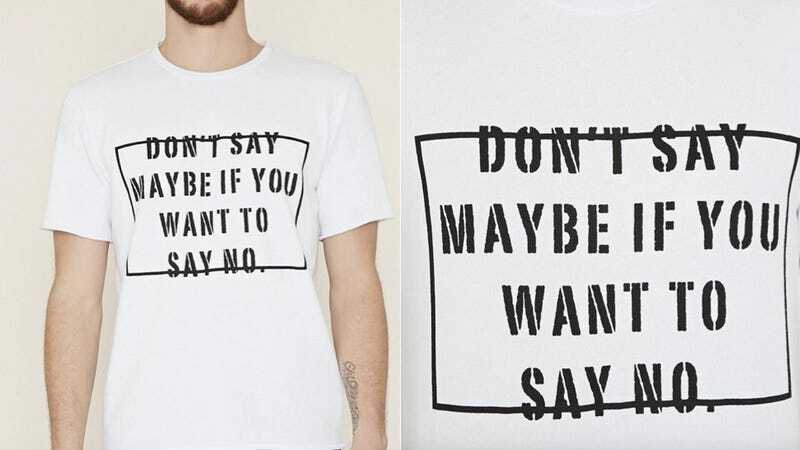 Why, head on over to Forever 21, where they’re currently hawking this very chill, very disgusting “DON’T SAY MAYBE IF YOU WANT TO SAY NO” tee. Only $19.90? At that price, you can’t afford not to buy it (and I can’t afford to not call the police when I see you wearing it). We’ve reached out to the company for a statement and will update the post if and when we hear back. Until then, say YES to great deals! UPDATE: Forever 21 has taken the shirt off the website and offers the following statement.